At Breckenridge Whitewater Rafting our River trip pricing varies depending on the trip you take, but right now we have some great river trip discounts on some of our most popular rafting trips! The Rocky Mountain rivers in Colorado have great whitewater trips for experienced paddlers and people just starting out. The best time of year to go white water rafting is during the summer months when the snow has melted and the runoff brings the water levels up. In higher altitudes there is a longer waiting period for the snow to melt and these late season run-offs are the source of some of the greatest white water trips in the world. Determining when and where to go rafting can seem like a difficult task, but at Breckenridge Whitewater Rafting we can help you find the perfect rafting trip. Breckenridge Whitewater Rafting has that trips on 8 different rivers in Colorado and each one can be different throughout the spring and summer months. Breckenridge Whitewater Rafting beginner river trips are available for most of the rafting season from May to September. Browns Canyon river trips and the Royal Gorge half day trip are both beginner trips that are easily accessible from Denver and our family rafting trips can accommodate children of all ages with slow motion through some parts to allow for swimming. 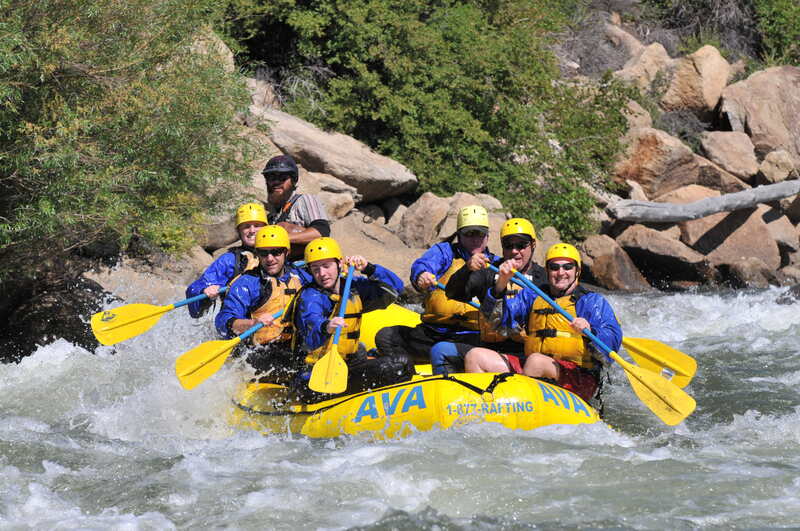 If you’re looking for a rafting experience with a little more excitement, Breckenridge Whitewater Rafting has the more class IV-V river trips than any other rafting company in Colorado. Our river guides have a lot of experience with these action-filled rapids to accommodate paddlers who want a high adventure experience. For a solid class IV rafting adventure, try BWR’s trip through the Numbers or a class IV-V river trip through the Gauntlet. Both of these adventures are available from May until September. For even more intensity overnight rafting trips can be a 24 hour visit to Browns Canyon or our three day mild to wild in Pine Creek. The overnight trips are available from May until September, but the outdoor temperatures are best from late June to mid-August. If you decide to do an overnight in May or September, be prepared for cooler temperatures at night. Breckenridge Whitewater Rafting will take you through the best white water adventures in the Colorado Rockies. If water levels are too high then Breckenridge Whitewater Rafting will relocate your rafting trip to a river that will be safer for you. The Blue River, Dolores River, and Eagle River have shorter seasons, but they may be open at the perfect time for you to go white water rafting so let us help you figure it out and find just the right whitewater rafting adventure for you. Email info@breckenridgewhitewater.com or call (800-370-0581) and we’ll gladly answer all of your questions.